This 48" Hospital bed frame has a quiet smooth operation. This bariatric hospital bed was developed with the patient in mind. The hospital bed is manufactured with a durable steel frame that supports up to 1000 lbs This hospital bed is comfortable, easy to operate and was designed with security and safety for the patient and care taker. The dynamic hand controls are user friendly and provide for multiple bed positioning and height adjustment. The medical bed is full electric so you can easily adjust the head, feet and height of the bed frame. This medical bed frame is designed for long term care commonly used in home health, nursing home or assisted care facilities. Use with pressure relief mattresses, gel mattresses, or alternating pressure mattress systems. 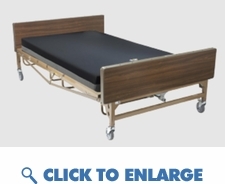 Full size hospital bed / medical bed frame. Full Electric Bariatric Hospital Bed 42"
Full Electric Bariatric Hospital Bed 54"